Emancipation & Liberation » GOOD FRIDAY AGREEMENT – THATCHER’S PROGRESSIVE LEGACY? GOOD FRIDAY AGREEMENT – THATCHER’S PROGRESSIVE LEGACY? John McAnulty of Socialist Democracy (Ireland) helps to clear up some of the confusion about Thatcher’s legacy with regard to Ireland. Some have argued that, after ditching the hardline Ulster Unionists in the 1985 Anglo-Irish Agreement, she opened up the way to the 1998 Good Friday Agreement (GFA). John, however, highlights that, the degree to which Thatcher was persuaded of the need to sideline ‘No Surrender’ Unionism, was also the degree to the British ruling class sought to maintain sectarian rule in ‘the Six Counties’, but in a new form. The Anglo-Irish Agreement brought the SDLP and Irish government on board, in a decidedly subordinate position, to help the UK state in running Northern Ireland. This paved the way, after Thatcher’s removal by the Tories, for the 1993 Downing Street Declaration. This brought the Republican Movement on board. The GFA has led to a new partition within ‘the Six Counties’ with the constitutionally entrenched recognition of British Unionism and Irish Nationalism. We can see the roots of the current decay of the post-GFA Northern Ireland political order in this continued sectarian legacy. Thatcher helped to ensure that this remained central to UK state policy, once she had decided to abandon her previous unquestioning support for the Ulster Unionist Party. Some new graffiti on the famous Free Derry Wall after Thatcher’s death. As with all the elements of Thatcherism, the policy on Ireland was in fact a continuation of existing British policy. Direct military force backed by various forms of internment, torture and the use of Loyalist death squads was used first to break the civil rights movement and then to crush the republican uprising. In parallel with this military strategy went a policy of improving the sectarian statelet and involving the Catholic middle class in supporting partition through various forms of powersharing. Thatcher, in the hunger strikes, was applying a policy of coercion at a time when the physical force tactic was clearly failing. It was in Britain’s interest to crush the armed resistance and break the mass mobilizations against British rule. In 1984, in the aftermath of the hunger strikes, Irish capitalists gathered in the New Ireland Forum and proposed three paths to a settlement of the Irish question. A united Ireland, A federation of North and South, Joint authority of Ireland and Britain in the North. Famously Thatcher replied: That’s out – out – out – to the options. Yet she then went on to sign the Anglo-Irish Agreement. Thatcher, in her bigotry, had missed the significance of the Forum Report. Irish capital had used the call for a united Ireland as a populist badge to retain the allegiance of the working class. Now, terrified by the social unrest generated in the South, they were seeking ways to abandon that. When the Anglo-Irish agreement was signed the 3 outs remained in place. Dublin was represented in a secretariat at Maryflield, but in a strictly advisory role. Britain pushed on with its original strategy and the Good Friday Agreement was firmly based on the 1922 Government of Ireland act. Ireland was to remain partitioned, sectarian rights would trump human and civil rights and Britain would remain firmly in control. As with much of Thatcherism, British gains in Ireland were based on sand. In Britain the battle with the miners saw a major defeat for British workers, but it was a defeat made possible by the capitulation of Labour and trade union bosses and the cost included a sharp decline in Britain’s manufacturing base. In Ireland the long decay of the physical force tradition was amplified by the lack of a class perspective. It proved relatively easy to co-opt the shinners into a nationalist family firmly wedded to an imperialist settlement, especially given the collapse of revolutionary nationalist movements on an international scale. Today there is growing concern about the unionist drive to reinforce sectarian supremacy and at the stench of corruption and incapacity from the local administration. What else could come out of a settlement dictated by Britain? 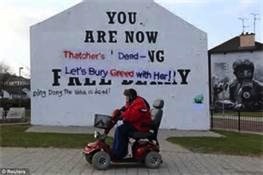 What other legacy would Thatcher leave in Ireland?